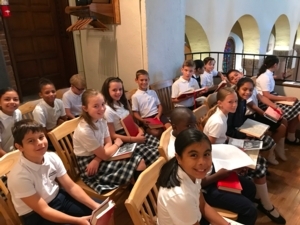 Saint Benedict Catholic School provides a warm environment in which its students are challenged to grow in the virtues and to acquire more fully the gifts of the Holy Spirit. The Three Theological Virtues—Faith, Hope, and Charity—are taught from Junior Kindergarten to 8th Grade both in word and in deed and form not only the foundation of our shared life but also the goals towards which we all aspire. The eager and joyful practice of the Four Cardinal Virtues—Prudence, Justice, Fortitude, and Temperance—provides a framework in which our students, staff, and parents work harmoniously in our journey together. And the Gifts of the Holy Spirit, including Wisdom, Understanding, and Piety, inspire and direct our academic, athletic, and liturgical endeavors as we strive to ensure ut in omnibus glorificetur Deus—that God be glorified in all things.